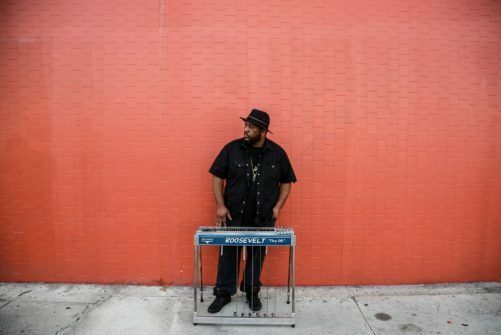 Pedal and lap steel guitar ace Roosevelt Collier, so proficient he’s affectionately known as “The Dr,” released his solo debut, Exit 16, on GroundUP Music. It’s a potent mix of blues, gospel, rock and, in his words, “dirty funk swampy grime,” as overseen by producer and Bokanté bandmate Michael League (from the Grammy-winning Snarky Puppy). Brought up in the House of God Church in Perrine, Florida, Roosevelt built his “sacred steel” guitar prowess alongside his uncles and cousins in The Lee Boys, known for their spirited, soul-shaking live performances. On his own, Collier’s become a sought-after talent both on record and on stage; at festivals, he is a regular “Artist at Large,” performing alongside musical luminaries in the fields of rock, blues and pop, including the Allman Brothers, The String Cheese Incident, Buddy Guy, Umphrey’s McGee, Los Lobos, Robert Randolph, the Tedeschi-Trucks Band, and the Del McCoury Band.